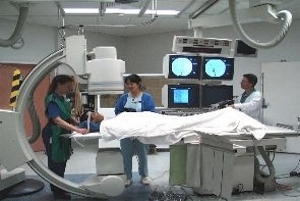 NIISwa comes from a long pedigree of Diagnostic and Interventional Neuroradiology. The first endovascular procedure for treatment of a brain arteriovenous malformation was performed in the Royal Perth Hospital Radiology Department in 1979. 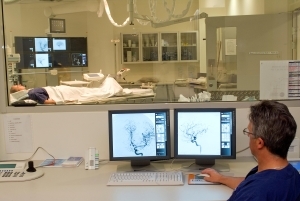 The interventional service was one of two to receive Federal funding as a Specialist Interventional Unit in Australia to formally evaluate the efficacy of endovascular treatment of neurovascular diseases. With newer developments in technology and skills, endovascular treatment has become available to other conditions. Endovascular treatment of intracranial aneurysms has been provided by the interventional neuroradiology service since 1992, and endovascular treatment of strokes since 2009. The Neurological Intervention & Imaging Service of WA (NIISwa) was commenced on July 1 2007 as the first specialist Neuroradiology Department in Australasia, amalgamating the Neuroradiology staff and services at Royal Perth Hospital and Sir Charles Gairdner Hospital into one, state-wide department. In 2016 NIISwa commenced providing neurointerventional services at Fiona Stanley Hospital, to allow better access to patients in Perth’s southern suburbs. NIISwa provides a state-wide, cross-campus service for both tertiary and quaternary Diagnostic and Interventional Neuroradiology. It is headquartered at Sir Charles Gairdner Hospital but services are provided at all three major teaching hospitals SCGH, RPH and FSH. Copyright © Developed by NIISwa.